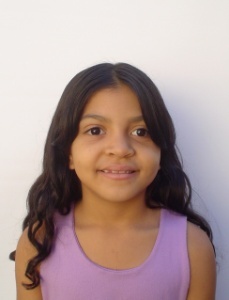 Gabriela is a young Brazilian girl who lives with her parents and sister and brother, in a rural community about 300 miles south of Fortaleza. Their simple home has brick walls, rough cement floors and a clay-tiled roof. It is self-built and has rudimentary sanitary facilities (cesspit). There is no sewage system in the area. Running water and electricity are available. Jose works as a farm laborer and the family also does some subsistence farming. The per capita family income is about US$ 30.00 per month. The family is Catholic and their native language is Portuguese. Gabriela is friendly, smart and studious. Her pet name is Gaby. She helps her mom around the house. She loves playing house, school, and with dolls. Gabriela is considered to have good health. She attends a public elementary school and loves Portuguese and Science. She wishes to become a nurse when she grows up. She participates in the project program where she receives benefits like medical and dental care, nutritional evaluation, remedial instruction, school supplies and uniform, cultural activities, and home visits. As our business grows, we hope to be able to do more charitable work in the local community and outside of it.